Materials Handling Video | Donnegan Systems Inc.
See how Donnegan Systems can provide you with space efficient, ergonomic solutions that will streamline efforts and maximize results. We’ve assisted with warehouse shelving storage in a variety of industries—from temperature controlled storage for a leading beer distributor to mobile racking for one of Boston’s biggest pharmaceutical manufacturing companies. For nearly 40 years, we’ve worked with professionals across many industries to design storage systems that take into account their current processes and solve their biggest challenges. Running an efficient warehouse is not an easy feat. There are so many parts of the logistics puzzle to think about—implementing warehouse management systems, complying with government and industry regulations, dealing with product safety and recalls, automating in the world of smaller, just-in-time orders—and all the while, adhering to a lean process that can eliminate waste and add value. What if we told you that simply rethinking your warehouse storage could cut down on the time you spend thinking about all of these things? Along with our Spacesaver partners, we’ve assisted with warehouse shelving storage in a variety of industries—from temperature controlled storage for a leading beer distributor to mobile racking for one of Boston’s biggest pharmaceutical manufacturing companies. 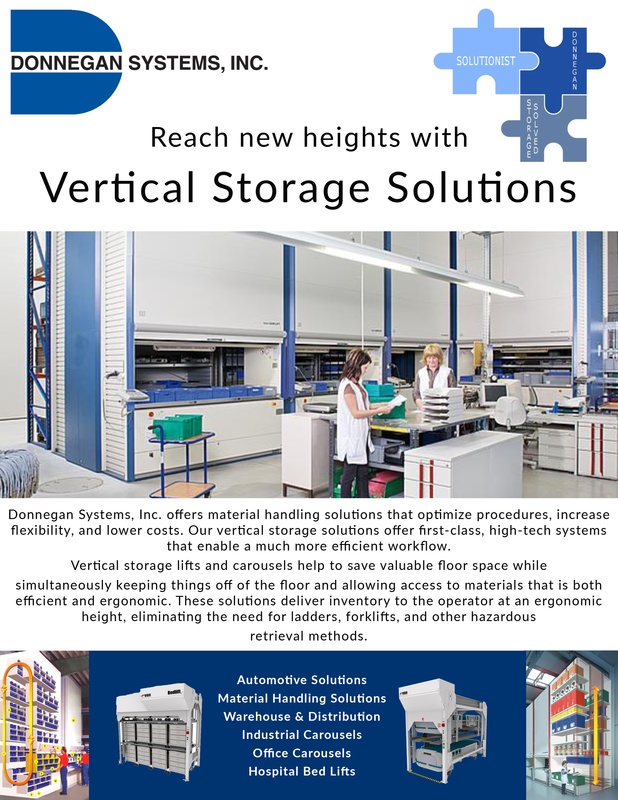 Download our brochure to learn more about our Industrial storage solutions. Donnegan Systems has helped warehouses across New England and Eastern NY save space, time, and money. Let us show you how to look at space a whole new way.